It was a fantastic day! We were finally awarded our Promising SME 500 2013 Business Luminary award last week. The Business Luminary award is to recognize true blue entrepreneurs who are a cut above the rest, which have a business visionary of immaculate integrity, humility and skill. Business Luminaries as described by the editor-in-chief of the Promising SME 500, Liu Q. Z., are those who have not only excelled in their field of expertise, but have grown with amazing velocity into established firms and corporations over short spans of time. I would like to thank my team, because without their hard work and commitment we wouldn’t have been able to achieve this. And most importantly, to our ever loyal clients and investors who have the utmost faith and trust in us, we thank you all for supporting us all these years. This award is dedicated to all of you as well. Be assured that we will still continue to strive to grow and be better at bringing under valued deals and continuously give amazing service to our network members. 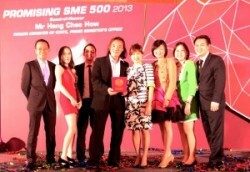 Below is an article featured in the Promising SME 500 catalogue. 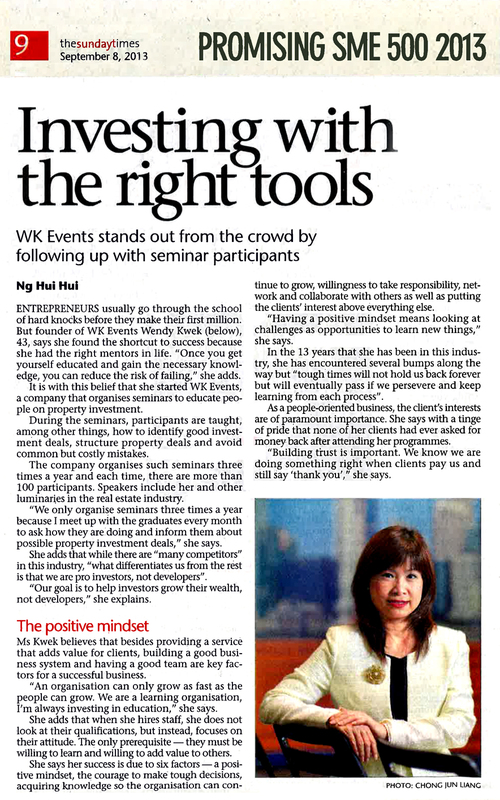 Here is another article published in Sunday Times last 8th of September 2013 on me and WK Events Pte Ltd, as part of the Promising SME 500 awardees.